What do YOU think? 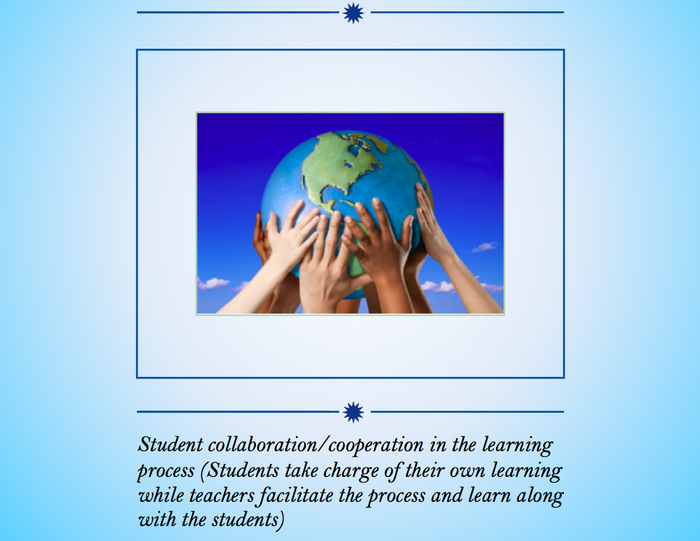 Share your thoughts at comments@grandviewc4.net as we continue to work together to focus our vision, learning, and work into our GC-4 Instructional Priorities. Oh yeah, and here’s another one for future pondering….What does “21st Century Skills” mean to you??? Simple question, complex answer. Stay tuned. Each of YOU (WE), need to remember this Manifesto. Because WE DO CHANGE the lives of others through the unique perspectives, talents, skills, and compassion we bring to our settings each day. YOU (WE) MATTER. “You’re more than just a teacher!” Via Justin, “Some of your students will get to know you better than anyone else in their lives. Research is quite clear in that a great teacher has a tremendous impact on the life of a child. 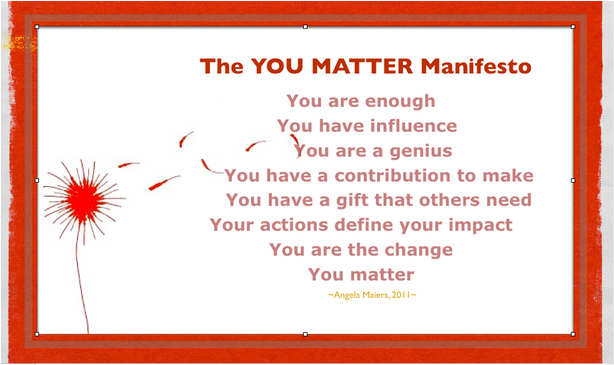 This is not just related to academic achievement, but to all facets of their life.” YOU (WE) MATTER. YOU have already changed the lives of many students, with more to come this year. Our choices and decisions REALLY matter. Finally, from Michael Linsin at Smart Classroom Management: 6 Things You Must Do On The First Day Of School. Please read the whole article because it’s awesome – but ok, here’s your summary: 1) Make a connection 2) Set a tone of excellence 3) Have some fun 4) Make a promise 5) Fulfill your promise 6) Dive headlong into academics. The result - BEAUTIFUL IMPERFECTION. Don’t worry that the first day of school has passed. There’s still time to do these things which will certainly support a FABULOUS year for YOU and your students. As the year begins and continues, let’s remember - YOU (WE) MATTER – THEY MATTER – OUR CHOICES and DECISIONS MATTER! Teachers are already seeking new strategies and learning about how to engage and empower students through rigor and relevance. Although we have a lot to learn about all of career instruction, I am particularly interested in creativity and innovation and what we can do to help students get in touch with and strengthen their own creative abilities. A TED talk by David Kelley suggests that creativity is not the domain of only a chosen few. Over the past two weeks I have had the great honor of meeting most of you. I am so excited about all of the great things going on in the Grandview School District; and about becoming a member of your team. Teaching and learning with technology can no longer be a choice. The stakes for our kids are too high. They are growing up in a connected world and will eventually be asked to become contributing members of society in an economy that is increasingly dependent on a work force with high tech skills. We are not just talking about jobs in the traditional technology fields. If our kids are to be successful in healthcare, education, manufacturing, the military, or any number of other traditionally semi-technical fields, strong digital literacy will be required. It is up to us to prepare them for this reality. As Dr. Teran likes to say, if we don't do this, "the 21st century will chew up our kids and spit them out." It's true, and it's our job as educators to ensure that does not happen. 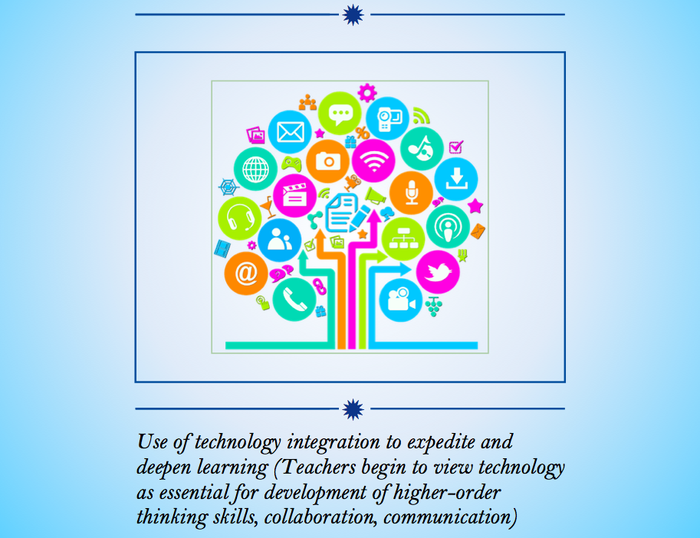 Despite that reality, integrating technology into our classrooms is no easy nor quick task. It is a process, not something that happens overnight. If we are going to be successful, we must work together as a team; collaborating, sharing, assisting, and most of all, learning and progressing. The first thing I noticed when arriving in Grandview is that a strong culture of collaboration exists, and that people here are so dedicated to doing what is right for kids. It is because of those two facts that I know Grandview CSD-4 will be successful and an innovator in the area of educational technology. My commitment to you is that I will do everything in my power to help you be successful in improving student achievement using technology as a tool. I want to be accessible! If we are going to be a team, we all have to be on the field! There will be plenty of opportunities for formal technology professional development, but please don't hesitate to contact me to meet with you one-on-one, in PLC groups, or department meetings as well. Thank you for such a warm welcome. It has made my transition seem like a breeze! Here's to a fantastic year of continued collaboration and learning in the Grandview School District! Please take a look at the video below. Some food for thought! Don't forget to bookmark our new Instructional Technology Website. It's the home base of our efforts to provide you with a place for anytime, anyplace, any pace support and professional learning. As I reflect on how fast the summer months flew by and look with excitement to this school year, I think about what a great time to start establishing Professional Networks. When we collaborate with colleagues at the building sites, across the district and not only in our country but the world, we have so many experts from which to learn. Educators are the ones who truly give from their hearts to help one another be successful by sharing instructional strategies, classroom materials and supplies and the encouragement to push for success for our student as well as the adult learners. Please click the link below to view the GC-4 Professional Development Calendar of Events to see upcoming and future PD opportunities. As the school year begins you will have received information regarding classroom accommodations for special education students, ELL students and students on 504 plans. It is important that we all understand the accommodations and what they mean. 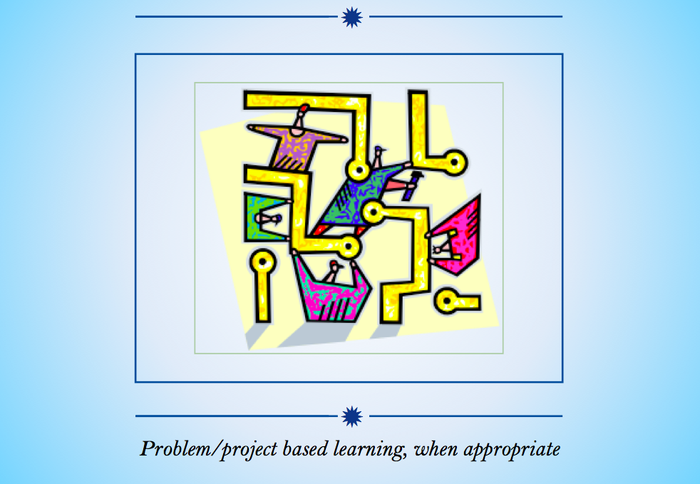 If unsure as to how to implement the accommodation/modification, please contact a special education teacher, process coordinator, ELL teacher or counselor for more clarification. Please refer to this link for further information and examples.